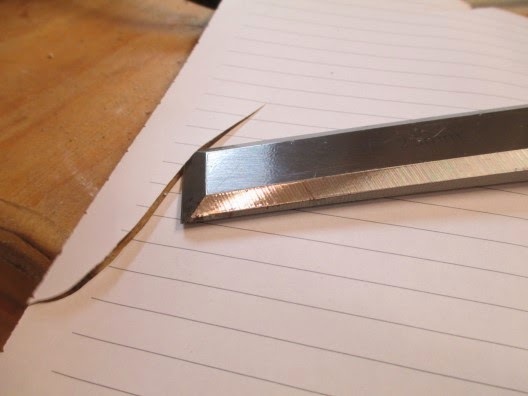 I got this idea after watching a video for the Razor Sharp Edgemaking system and wanted to try it. Their system uses paper wheels. I reckoned, why not something like MDF? 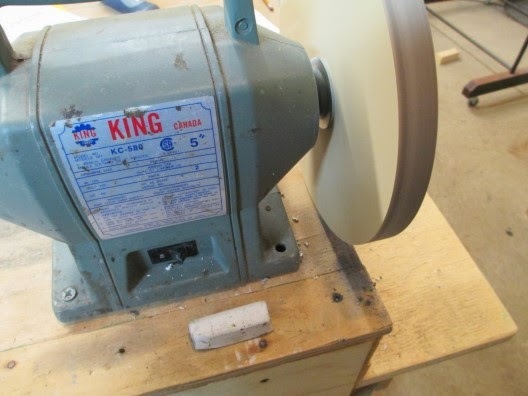 The hardest part for me would be making a wheel without a lathe. I opted for the tried and true table saw with a sled. 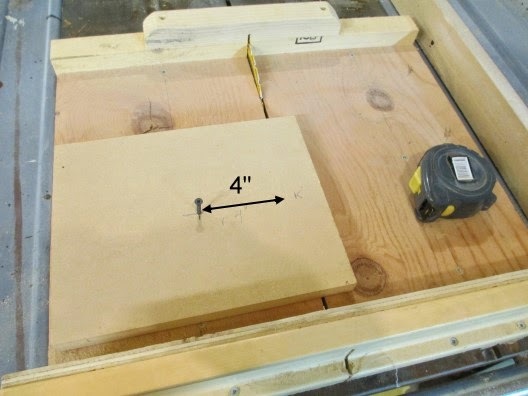 I started with a chunk of 3/4" medium density fiberboard (MDF). Anything about 10" square will work. 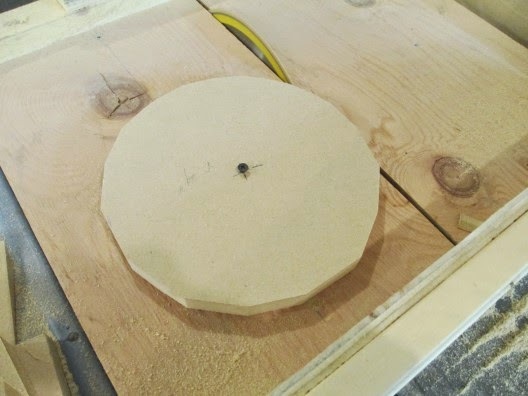 I cut this piece down a little as I was planning on making an 8" wheel. 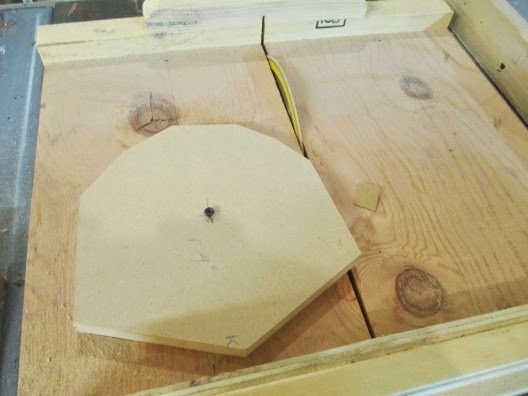 Screw the board down to the sled so the blade will 4" from the screw. A 4" radius will make my 8" wheel. Brilliant! Slide the sled back and forth while rotating the board. Soon a coarse circle appears is formed. 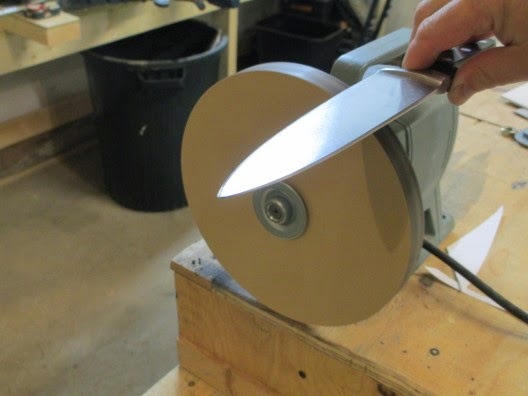 Then with the sled stationary, rotate the wheel until the blade doesn't take any more wood off. We have a fairly true circle now. 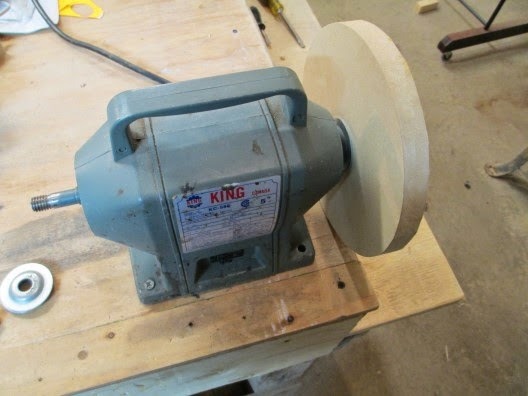 Drill out the centre hole to match the shaft on my bargain puny garage sale grinder. Voila! Give it a test run. 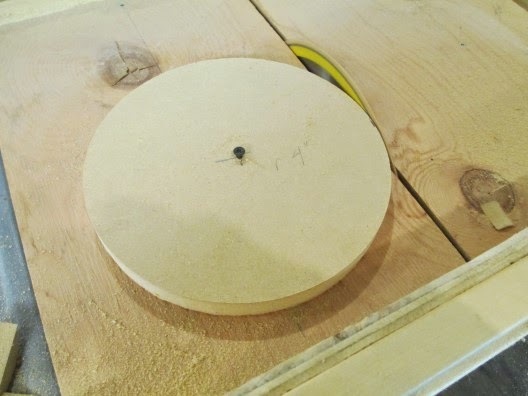 If it's not 100% smooth (and mine wasn't) use a a block of wood and 60 grit sand paper. 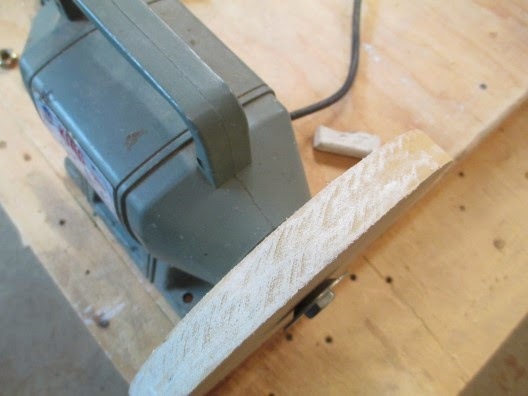 Hold the block of wood against the bench to act like a tool rest. 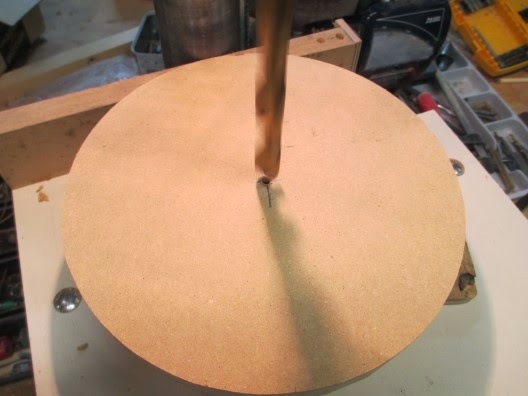 The sandpaper should only touch the high spots and leave the low spots. This took about 5 minutes of truing. Turn the motor off. Now work some white polishing compound around the wheel. The professional system uses a special lubricant to reduce heat. You can apply some more compound as you use it. 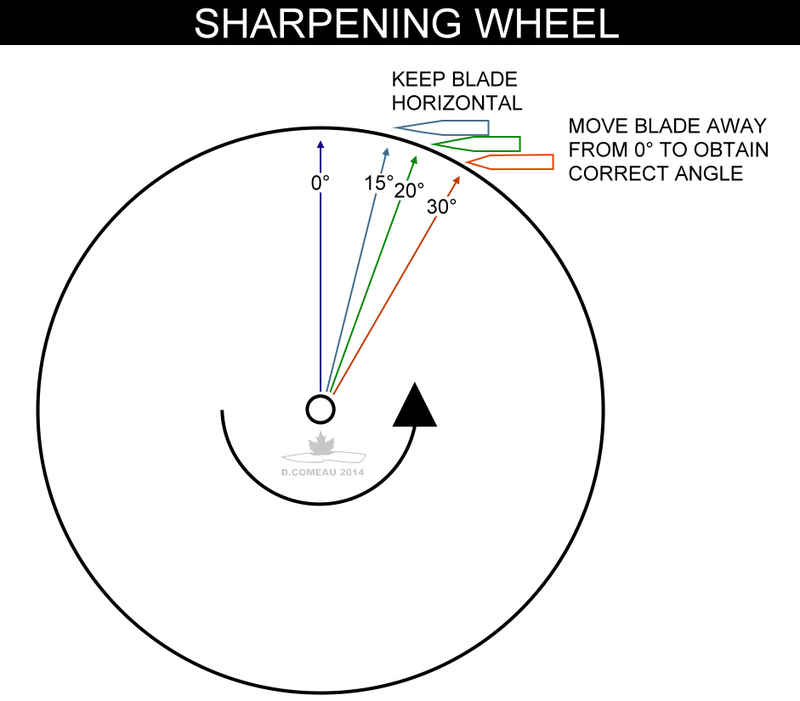 It is very important to note that the wheel must always move OFF OF THE BLADE. Do not risk catching the blade in the wheel. This is the correct approach for honing. I pass from ricasso towards the tip. One side, then flip and do the other. Check for any reflection off the cutting edge. When the reflection is gone. Give it a test. Sharp like brand new Olfa blade! My abused chisel went from dull to shaving sharp in seconds. I can't wait to try it on some knives. Of course this is only for the finest honing. If you've got nicks to deal with, you'll have to get it to a near wire edge first. If a razor is for shaving, then this puppy is sharp like a razor. This is really hard to photograph, but what you are seeing is the reflection of the secondary bevel. 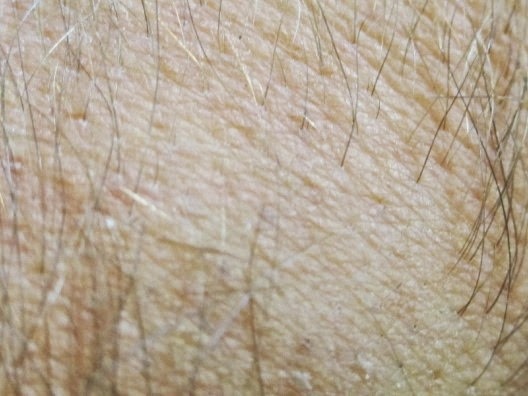 The words "ZOOM LENS" can be seen in reverse. 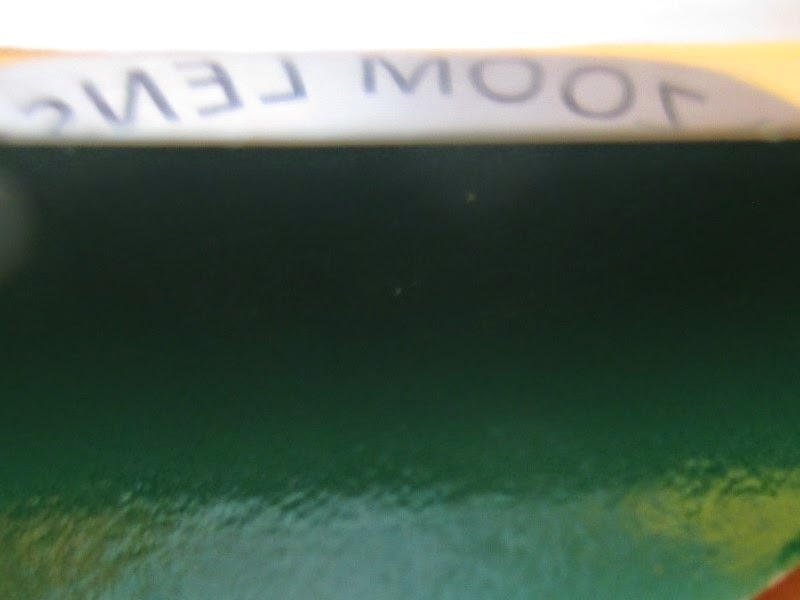 The edge is has been mirror polished by the compound. Super fast and inexpensive. A cared for blade can be touched up in only a few passes. Amazing bargain. A video I made for my YouTube Channel. Seriously easy and useful tool! Thanks for the heads up on an easy way to make sharpening less work. 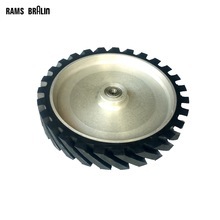 What is the polishing compound that you purchased can you put up a link to it please? 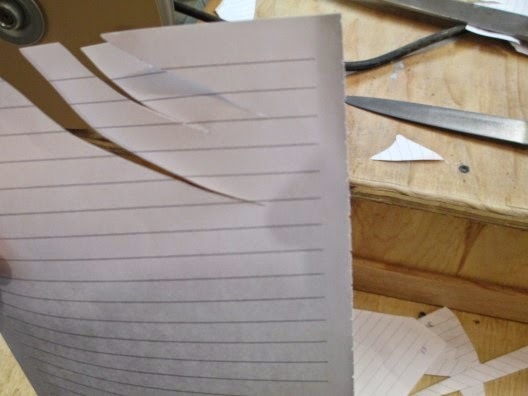 Can we glue thinner sheets of MDF together for this? I can see no reason why one couldn't use a laminate. Make sure the glue is evenly covering the pieces and clamp them until dry. 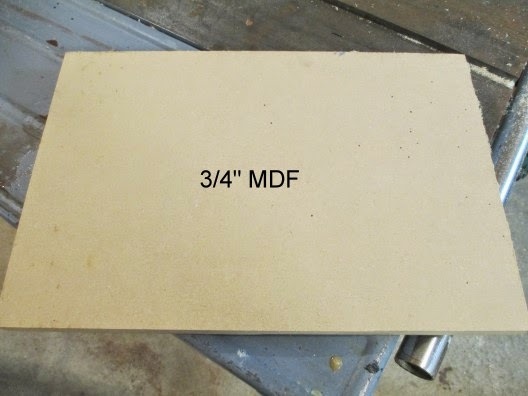 This will joint will be stronger than the MDF itself. would there be any advantage to covering the circumference with leather?? The advantage to using leather would be that it could hold more polishing compound. The disadvantage is that the leather must absolutely stay on the wheel. Yes, the wheel gets caked with polishing compound. I've always added some more and carried on. To clean this from the knife edge some acetone or mineral spirits work well. Ok, yeah I just used acetone and it helped a lot. Just need practice with the sharpening, I'm getting them sharp but want them sharper. Thanks for you quick response Dan! You have a good one. Do you know if this works? Yes this should work. Also, ask a jeweler if the sell "jeweler's rouge". It is a reddish brown abrasive wax compound. can a person just use regular partical board for doing this or does have to be "medium density"? I don't know how reliable low density board would be. My concern with the radial forces and the possibility of pieces coming loose. Prefer MDF or HDF. Could I rewire the grinder in reverse so I have easy access to the on/off switch? It entirely depends on what wires are available motor terminals. Some motors bring out the capacitor and start winding wires, while others only the capacitor wires and one start winding wires (cost savings for the manufacturer). It's not simply a matter of swapping the power leads. A capacitor is generally used to determine the rotation and the changing the incoming power has no effect. There is another consideration. The arbor nuts are threaded so that they maintain tightness when the motor spins in the intended direction. Running the motor in reverse would encourage them to loosen off.